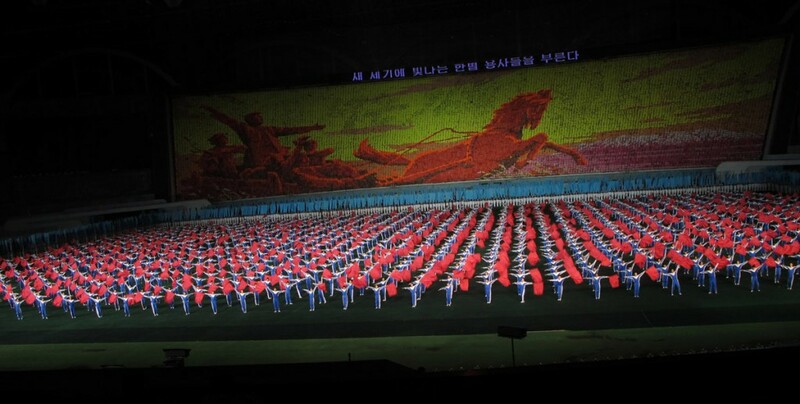 The current version of the games, the “Arirang”, tells the history of North Korea through a giant series of dance and gymnastic sequences. There are reportedly up to 100,000 participants, although only a few hundreds or thousands appear in any one scene. Fifteen thousand children with giant flipcard books provide a continually changing background display. The games take place in a giant custom-built stadium. I had coughed up the 150 Euros (ouch) for a first class seat in the central viewing area. The many scenes include the historic birth of Korea; the struggle against the Japanese; a celebration of the birth of Kim Jong Il (yes, really! ); the happy prosperity of the nation (!! ); a joyful vision of the future reunification of Korea; and a paean to Chinese-Korean friendship. The tone is not particularly militaristic. It is often light and in a few places even playful, with friendly pandas doing pratfalls, and comical chickens and pigs dancing to celebrate prosperity. There is no overt hostility to either South Korea or the US. But the background music is stirring, the massed coordination is often daunting, and the general mood is intense and fervent. Photographs and videos can’t really convey the intensity of seeing the live performance. As soon as you step in, you are swept up in the forceful warm-up music. The staging and presentation are extremely skilful: you initially see a vast wall of banners and then through them advancing what seems like an infinite army of performers. The stadium is too wide to be easily taken in in one glance, I had to keep my eye roving to see the full picture. The scene transitions are often cleverly dramatic: as one scene winds down and the actors start to exit, we are allowed to glimpse a new army of performers massing in the back, then the lights are dimmed, leaving just enough light to see a shadowy horde surging forward onto the arena floor. The dancing and gymnastics are well choreographed. If they were performed by a few score people, they would be only moderately amusing. But when they are performed on the Mass Games scale they become a very different thing. 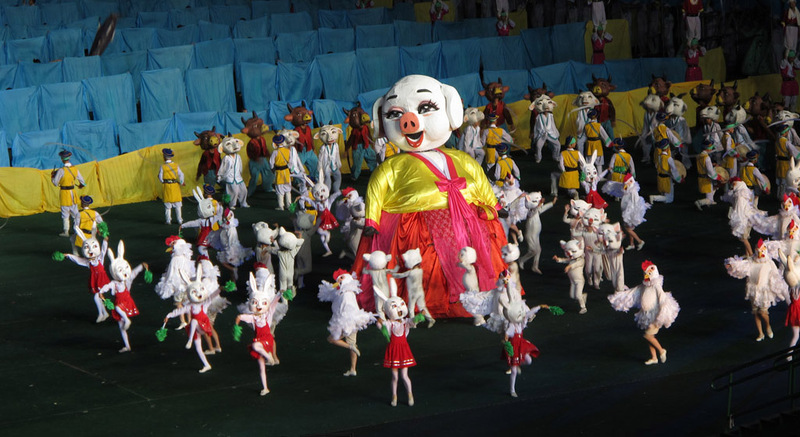 Some of the scenes are elegant ballet like performances, other are mass marching or banner waving, others are seemingly informal, such as the invasion of the happy farm animals. Most of the performers are young adults. A couple of scenes involved hordes of 8-10 year olds. The performances are skilful, but on this scale a few flubs are probably inevitable. I noticed a couple of the younger kids accidentally collide and go sprawling. But part of their training seems to be in quick recovery, and amidst the mass of performers you have to watch carefully to spot glitches and the overall experience continues undisturbed. There was heavy rain in mid-performance. We spectators were safely under cover, but the performers got pretty wet and had to cope with shallow puddles. I liked the experience enough that I coughed up more Euros the next day for a second look. It was actually better the second time, partly because I had a better sense of what the script was trying to say and partly because I could anticipate the timing and what to watch for. Also, since it was dry, they were able to include the concluding grand firework display this time. It’s great. Just do it.